This entry was posted in Daily Zen, Ithaca, Music and tagged Bass, Snake Oil Salesmen, The Nines, Utilikilt by Paul Schuh. Bookmark the permalink. 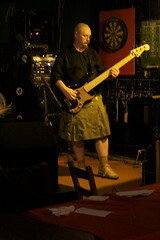 You are THE talwart, bald, utili-kilted bass player! your latest is on the way…….dude…..I have been working IT Security for the last 15 to 16 years….and play bass, although not recently…..don’t tell me you also ride a Harley and work as a pro-wrestler as well…….. IT Security for about 14 years, bass for about eight. Been thinking about getting a Harley, but definitely not a pro-wrestler.